A ring is the perfect gift for the number one person in your life — you! t Gift giving isn’t always about other people; sometimes the person who needs a gift the most is you! I try to make a habit of buying myself one special gift each year, usually a piece of jewelry. This year for Valentine’s Day I’ve decided to buy myself a new ring. It’s not the ring but it will be special nonetheless. t Here are seven of my favorite jewelry designers and the rings I’m totally coveting at the moment. t I really love mixing architectural pieces with others that are more delicate and romantic, so I pretty much love everything from TOMTOM. Designer Elena Howell is a trained architect and uses a lot of different digital cutting techniques to create some really unique pieces. I’m really into black stones at the moment, and she has quite a few black and gold combos. t The original love knot! Ariel Gordon is one of my favorite designers because nearly everything she makes is geared toward girls like me who don’t change their jewelry every day. I love having staple pieces that I can wear for months at a time, day or night and they still feel special. Join her mailing list and receive 25 percent off your purchase! t Definitely a bit of a splurge, but Jennifer Meyer pieces are delicate, timeless and great for everyday wear. 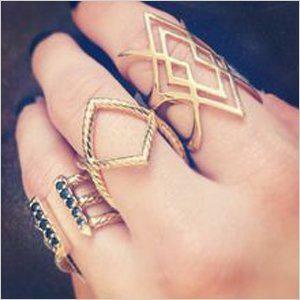 I love that you can stack different shape and design rings from her collection to make something all your own. I prefer yellow gold, but her collections are all available in white and rose gold as well. t When I’m looking for a statement piece, Alexis Bittar is my go-to. Whether you like interesting stones or molded Lucite, everything he makes is curious and unique but still totally wearable. t I only recently discovered Gorjana & Griffin, a husband and wife team designing accessories for men and women. I really love how they mix delicate, romantic pieces with more whimsical designs and larger statement pieces. And meh describes me just a little too well — I may buy it just because! Their price points are very affordable and if you become a ggINSIDER, you get 15 percent off your first purchase. t I’m not afraid to admit my love for all things Olsen twins, and Elizabeth & James is no exception. All of their jewelry is feminine with a great edge to it that’s almost masculine, but still delicate.The white topaz stones help keep this ring affordable.